Let’s say, fishing is your hobby, after a long tiring weekend you get yourself to a beautiful place with a kayak and best fishing rod for salmon or big bass on your mind and planning for a smoky barbecue tonight! Or your kids want to have some fun with a reel and rod he can handle. But everything can be ruined if your fishing equipment like fishing rods or the Spincast reels are not up for it! Yes angler folks, it can be turned out to be a waste of time and money. 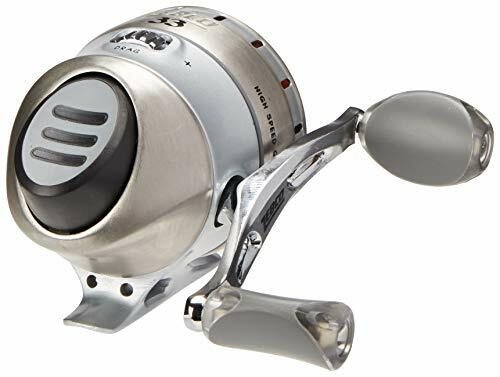 Today in this article we will discuss with you some Best Spincast reel for saltwater that can make your fishing trip a successful one. Not only that but also we mentioned some cool pieces of information about Spincast reel which will help you to choose the best saltwater spincast reels for the money. However, don’t forget to take your fishing line. I personally recommend you to take Monofilament Fishing Line Which is one of my favorite fishing line for saltwater fishing. When I go fishing, I always take it with me. If you are in a hurry then just check out the Table of Content to jump over anywhere through the article. 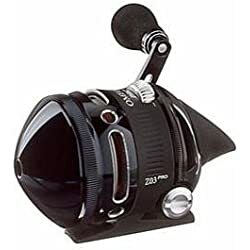 And one more thing, if you need some of the Best saltwater spinning reels, For your next trip then we got an awesome list of spinning reels which are simply the best and also your wallet friendly! So let’s have a look at our top 6 spincast reels review. We added here most of the popular reels among the market. Have a look at all the spincast reel reviews to get a better idea and pick the reel you want. Considered one of the best Spincast reels in the market today. A design that defines the meaning of Spincast Reel. The Zebco Omega pro is our Top review geek’s choice. Let’s find out the reasons that made us choose this reel over others. One more thing, do you know that Zebco has also got a combo offer? Yes, folks, they do offer a balanced affordable rod and reel setup. So don’t forget to check out the Zebco 33 Max Camo Medium Heavy Spincast Combo (2-Piece) in case you consider a rod and reel combo! There are two models with different weight. The ZO3PRO is 10.6 ounces whereas the ZO2PRO is at 8.1 ounces.Both of this model have very little difference between weight. So, if you fish for a long time, the lightweight will certainly help. One thing I noticed how perfectly it shifts around weight when I cast my line. That balance really helped me cast more accurately with this reel. The dimension of this product is 8.5×9×5.5 inches. Both models have similar gear ratio, 3:4:1. It may not look much but certainly fast enough to get the job done. You can retrieve 19” of line per turn so expect a little handful work. Each model has 6+1, a total of 7 stainless steel ball bearings. If you think more is better than you are wrong. Luckily for us, Zebco put premium quality bearing so we can feel the smooth casting and retrieving. And stainless steel means less wear and better corrosion resistance. The reel uses traditional internal drag system. It is both performance and cost-effective. It has a triple-cam multi-disc drag which protects your reel against sudden backlash from a resistant fish. Zebco ZO3PRO supports mono line with a rated capacity of 10 pounds/ 85 yards. On the other hand, the ZO2PRO model is also Mono line compatible with a rated capacity of 6 pounds/ 85 yards. It sports a continuous anti-reverse system thanks for that powerful brass worm gear. The reel can be operated with either of your hand simultaneously. This will help when you are fighting to land a fish. You can quickly change the spool since it offers a free spool for faster line switch and quick-change spool system. Please note that the ZO3PRO comes equipped with Power & Speed handles that offers you great leverage with hard-pulling lures and heavy fish. This is a solid build reel. You will feel that premier feeling the moment you hold the reel in your hand. Die-cast aluminum body and silky smooth aircraft aluminum cover give the reel a distinctive look. An impressive 4.3 overall rating combined with approximately 83% satisfied customers, the reel is on a roll even till to date. Our expert team has chosen this reel is their top pick. A premium build quality with a reasonable price tag attracts a lot of interest from the angler community. I’m still enjoying mine when you’re gonna get yours? From 1995, this Japanese company Daiwa delivered some of the finest fishing gears. 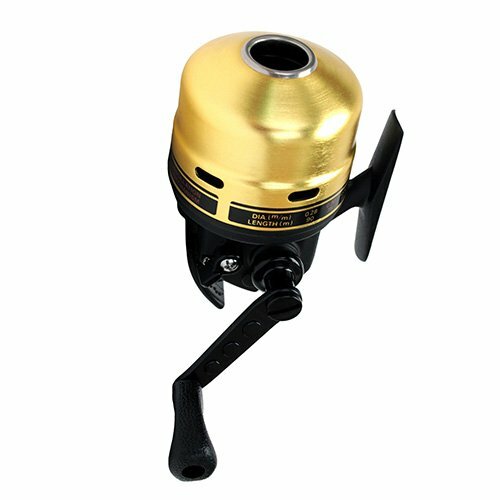 Daiwa goldcast spincast fishing reel is one of the best reels both for freshwater/saltwater. They offer great reels at an affordable price. 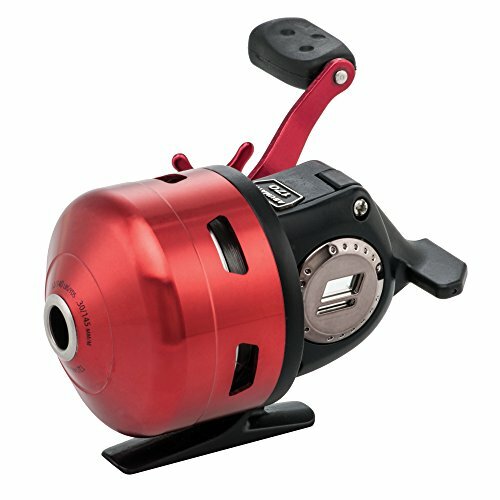 This 14.4-ounce (shipping weight) spincast reel is incredibly lightweight and ensures you a long fishing trip. 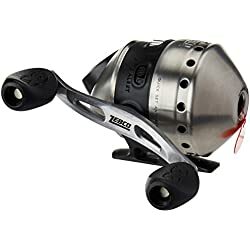 Professional angler most likely to use this particular reel because not only it is lightweight, but the way it shifts its weight while casting, is simply amazing. Please note that each model has different weights. It is also very compact in size. Only 4.2×4.2×2.8 inches. Its compact size ensures both hand compatibility. There are three models in Daiwa gold line up. Each of them has a similar gear ratio that is 4:1:1. It is fast enough to land any sizable fish, especially bass. This is where the interest may take a downhill dive for most anglers. Because it has a single stainless steel bearing. You know back in the day it was perfectly normal for reels to run on a single bearing. I still remember my old man bought one 18 years ago. We had some good times. And the reel performed smoothly. Tired of tangling your line! Well, worry not my friend. This spool will solve it. Thanks to its oscillating spool levelwind that offers consistent tangle-free line winding. You will never bunch up your line in a single spot with this reel. Nope! No ordinary pickup pins. It has this rotating tungsten carbide line pick up pins that resulted in a decent casting and retrieval speed. What if a big fish suddenly pulls the line harder? You will barely feel any backlash while dragging with this ultra smooth multi-disc internal drag system. You can even adjust and tune the system according to your convenience. This is where these three models differ. So before you select one, make sure it meets yours intends. The GC100 model is also Mono line compatible with a rated line capacity of 10 pounds/ 80 yards. You can reel back 20.8” line per turn. And last but not least, the GC120 model is also Mono line compatible. The line capacity is rated at 12 pounds/ 100 yards and reel back 21.3” line per turn. This reel features a selectable anti-reverse option for solid hooksets which further improves your line retrieval.Oversized line guide that is scientifically designed to improve your casting and retrieving even more. It also sports a reversible handle so you can use it in both hands simultaneously. For perfect casting, each Goldcast reel designed with a cone for line opening. A silky smooth ring encircling the opening and makes the whole process practically frictionless. The frame material is graphite for endurance and lowers the costing. 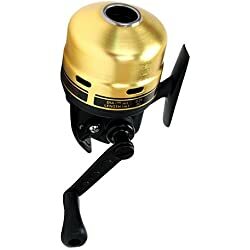 Rated 4.1 and an estimated 79% satisfied customer, the Goldcast Spincast reel has marked its place in the market. This reel is an example of how time and classic ideas are always worthy. Apart from that one bearing let down, this reel has stood the test of time and proven its value. Now, you are probably thinking to skip this one. But hear me out here, as a fellow angler it is my humble suggestion to you, try it at least once and feel the difference between other reels. Also, here is a Daiwa Golcast Combo offer for you. After all, not many mechanisms hold out for 24 years. Now, if there were ever a saying called “bang for bucks”, the Pflueger president Spincast reel is the perfect example. A great gift for your kids to make them happy. By no means it is kid stuff, serious anglers also find this reel very productive with a practical price tag. 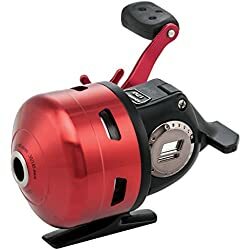 Please note that the larger reel is a spincast model that mounts and those other two reels have similar spool size and that USCX is an underspin model. Also, here is a Pflueger president spincast combo offer for you which comes with the metal finishing eye-catching latest version. All the three models are weigh in less than a pound. Excellent for long fishing hours. The lightweight also gives super convenience to younger anglers. The PRES6USCX comes with a 3:4:1 gear ratio. Although it looks a little slower on paper but performs fast enough to get the job done. On the other hand, the PRES6SCX has 3:1:1 gear ratio. The bigger model, PRES10SCX has 3:8:1 gear ratio. So you better pick your poison to your accordance. All the model has 5 ball bearings. These are corrosion resistant stainless steel solid build quality, ready to handle any harsh condition. These bearings also make casting and retrieving silky smooth. It is known to be one the smoothest bearing system in the market today. The titanium pins ensure durability and excellent reel performance. All three model comes with it. Your line will get better lifespan, thanks to those premium pin quality. The reel sports a traditional internal drag system. Classic yet very performance and cost-effective. The system consists of a thumb adjustable disc drag. You can adjust spool applied drag using the drag dial on top of the ball button. The maximum drag of these reels is rated 6-8 pounds although it’s not mentioned by Pflueger. All three models support mono capacity line. The 6U and 6S model have identical line capacity rated 4/145, 6/90 and 8/70. Whereas the bigger one (10S) can take up to 8/90, 10/75 and 12/65 respectively. Please note that the smaller numbers are indicating pound and the greater numbers are marked as pounds. 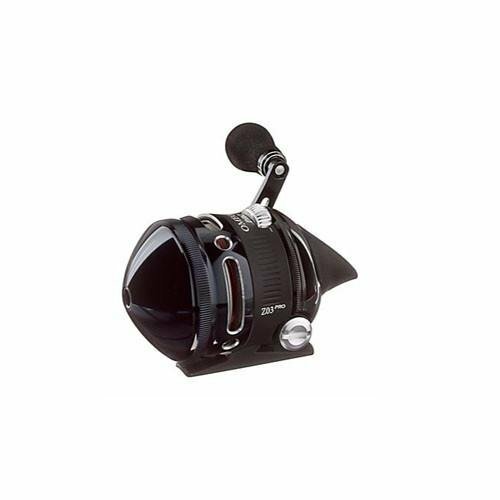 Equipped with instant anti-reverse capability, the President reel features split-second hook sets. So if you apply the anti-reverse, it will kickstart the next feature right away. With a retrieve capacity up to 14 inches per spin, you are bound to give the reel’s handle some quick spin. To make things comfy, a soft touch rubber knob is inserted at the end of the aluminum handle. Not only it will allow a firm grip, but it also keeps the all metal reel perfectly balanced in hand. This is a no joke solid build reel. Don’t let the lower price tag fool you. The handle is made from aircraft grade aluminum. Pflueger’s signature high quality machined aluminum cone design gives it a distinctive look as well as maximizing durability and precise gear alignment. And I personally love the Pflueger president sizes variation. The customers have given a very positive review about this particular reel. It satisfied 85% customers and isn’t looking to slow down anytime soon. There a handful of reel available on the market which has very little to absolutely zero issues. That’s why I chose this reel to share with you guys. Just confidently press ‘add to cart’ and never look back. Most of us anglers are skeptical about spin cast reel. They think its kid stuff but not anymore. Zebco has been producing some quality reels to meet the demand of modern anglers. This Zebco bullet spincast reel with a tangle-free line is one of the best they offer. Just pop the cover and see those all metal gears shine and ensure durability as well as longevity. Imagine a reel that is lighter in size yet premium quality. Zebco bullet series has turned the fiction into fiction. Weigh in at only 1.19 pounds and a dimension of 7.6×6×3.8 inches. Compact enough to make an impact. One of the fastest gear ratio in its class. Although it is measured at 5:1:1, bullet incorporates impressive patent-pending technology which helps it perform faster than a 6:2:1 baitcast reel. Equipped with a 9-bearings (8+1) super-smooth instant anti-reverse bearing system combined with high-velocity, high-power, CNC machine cut brass driver gear. That oscillating spool with revolutionary frictionless twin breaking supported pick-up pins that help faster line retrieving. Zebco bullet series sport an internal drag system which maneuvered around by a small wheel on the body just above the release switch. Most common system on a spincast reel. It amazes me that the reel manages to reel in 29 inches of line per handle turn yet has a maximum of 14 pounds drag capacity. It feels like a gift when you pinch out that pre-spooled with monoline right out of the box. The recommended line capacity is 85 yards/10 pounds mono line. Talk about built like a tank, zebco bullet zb3 reel is very durable. The front cover is forged with dual anodized aluminum. The handle feels unique because of its padded with all-weather compatible gripe handle knobs. The FreeFlow micro 3mm line guide helps assures greater cracking power accurate and furthest casting distance. The spool has a few to no issues. And it managed to build trust and confidence to nearly 76% of the consumer. But there are a few issues faced by some customers. One of them is locked up upon retraction. And grinding sensation when retrieving the line a little faster. Well hey, not every day we find a reel that is well built and even goes head to head to a Baitcaster. My personal experience was eventful, in a positive way. So go ahead, give it a try. It’s not the end of the world, trust me. 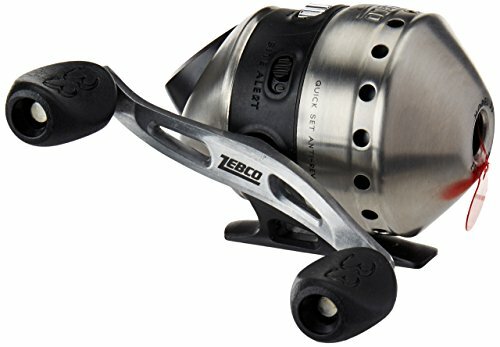 Zebco really turned some head when they dropped their first ever 7 bearing Spincast reel in the market. This may not sound like a big deal because there is many more reel with even higher numbers of bearings, but still, the Omega ZO3 maintain a nostalgic sensation among experienced anglers. You can easily fish for long hours with no worries. After all the reel only weighs in less than a pound. Not the fastest gear ratio as one might hope for. But still relevant enough to get the job done. With a gear ratio rated 2:9:1, you can easily retrieve and cast your line in a timely manner. Like I wrote before, the Zebco ZO3 is the first ever 7 ball bearings Spincast reel in the market. And the good news is, it’s all stainless steel so no immediate wearing and corrosion building. For better balance while casting, that Levelwind oscillating spool helps a lot. You will see up to 3 times positive line pick up thanks to its ultra smooth worm gear. The traditional internal drag system is incorporated within the Zebco ZO3. This helps maintain the price tag and also produce a practical performance. It also sports a triple-cam multi-disc drag system which grants you excellent control upon dragging. It may not offer the longest yard but, in contrast to a spincast reel, it’s quite enough. 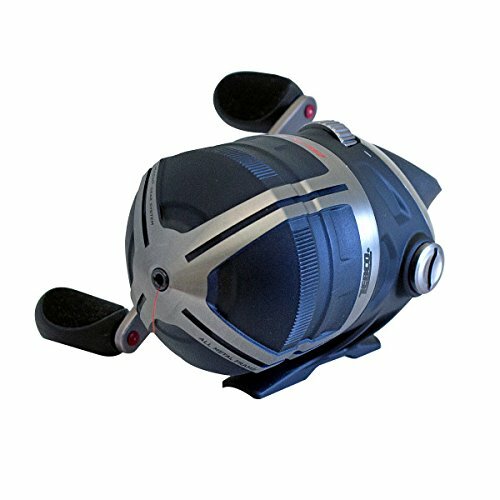 You can do medium type fishing with this reel. The line capacity marked at 10 pounds/85-yard. We already know that the smooth worm gear in this reel makes anti-reverse buttery smooth. But we are forgetting how the line friction against the guide. That’s why it has a ceramic line guide and pick up pins for frictionless retrieval. The reel’s diecast aluminum body and aircraft grade aluminum cover also helps absorb even the slightest vibration. The reel is also known as the legend of Spincast reel and with good reason of course. Look at how it satisfied 88% consumers worldwide. This is one Spincast reel which has absolutely zero complaints. Not much to say about this reel. I remembered the day I opened my package. The first thing that really gave me a positive feeling when I saw that extra pre-spooled with mono line. Premium design, lightweight, durable, free spool, and a practical price tag. Sounds like a perfect marriage. Spincast reel is a less complex version of the spinning reel. The major difference between all other reels and spincast reel is its spool is closed with a cover. It’s a reel which is a variation of a traditional spinning reel with some added and less complicated features. It uses a bait that floats to attract the fish and hook them. With a spincast reel, the line is released from a fixed spool and can be utilized with light lures and baits. For fishing, line twisting and snare is a big issue, yes I’m talking about the disgusting bird nest and net like roots. In spincast reel, these issues are solved. All the more reason for amateurs to chose this reel over others. There is a misconception about the spincast reel, some folks say that spincast reels are the kiddies reel! 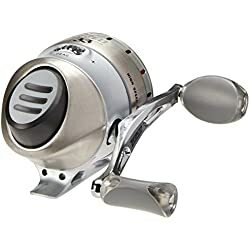 No offense but lemme tell you, folks, anyone who knows the proper appliance of this reel can really achieve some good catch. Although known to be the novice reel, but in a hand of a true maestro angler, spincast reel can do a lot. But If your kids want to cast their first line, get him a spincast reel. He will learn the art of angling easily. It offers the easiest handling of all fishing reels out there. The second amazing fact is, it’s comparatively cheap. There are those highly expensive baitcasters and spinning reels best suited for expert anglers. But for a newbie, spincast reel offers effortless performance for an affordable price. They have a solid, durable yet simple construction which makes them perfect to start off with. Mostly the beginners buy these spincast reels where there is maybe some lack of experience of buying it. And as Top Review Geek cares about your time and money, we thought why not mention a buying guide for you so that you can buy a good product all by yourself! Trust me, it will be super easy to choose a spincast reel if you know the basics and also gain an overall knowledge of Different Parts of Spincast Reel. So no further delay, let’s jump into the facts. There are a variety of sizes to choose from. As it is a reel for media type fishing, it can’t handle big fishes. So Small fishing like bass or other sunfishes needs lighter rods and lures. And for that, a really lightweight reel is needed. Aluminum or with a blend of aluminum/graphite materials used for reduced weight without comprising strength or durability. So, must check the materials of the reel. Spincast reels don’t offer much line capacity as baitcasters do, that is one of the major downsides of these reels. But it’s ok though for the basic purpose. when it comes to a saltwater spincast reel, the material is an essential fact. Normally all the spinning reel is made out with 1. Aluminum 2. Graphite, as you know aluminum is heavier than graphite but offers better corrosion resistance. It’s always better to choose a reel with combined material construction. Gear ratio means the number of teeth in each gear. Most f the gears found in spincast reel doesn’t have a lot of teeth. So, you are likely to experience a slower gear system. This isn’t the case for every reel but as a general. Drag system means the ability to generate stress by the line on a hooked fish, it’s very important folks that you need to know. With a powerful drag system, you will be able to land your desired catch. For smooth fishing, bearing is an essential component. Remember, more isn’t always better. Look for qualities like stainless steel and corrosion resistant that helps prolong your reel’s lifespan. Q: What are the difference between a spincast, spinning and a baitcasting reel? Ans. Well, the major difference between all of these reels is in design. There are also some significant differences in ability and performance. 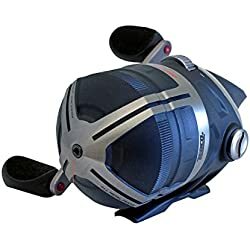 Spincast reel has a closed and shielded design using different materials as for cover, it allows you to control the spool and line all bye with your thumbs. You will find a release button only in this spincast reel. Spinning reel has an open face design where you can see the spool spinning! Baitcaster reels also have covered around the spools but not completely hidden! You can actually see the spool. And other thing is, you have to control the casting by simply press your thumb manually in your spool. Q: I am a complete beginner, which type of reel will be better suited for me? Ans. As a beginner, you should look for a reel with simple mechanism and easier applicability. Not only spincast reel meet these demands, but it will also put less stress on your wallet! Q: Can my kid handle a spincast reel on his first fishing trip? Ans. Absolutely! He or she will learn and feel the sensation of fishing. Q: what are the major advantages and disadvantages of spincast reel? Compromised castability, can’t cast long! Q: what are the signs of an excellent spincast reel? Made with Durable and tough materials such as aluminum. After all these discussions, let’s say that fishing with a spinning reel is fun. A beautiful way to end your weekend or holidays. The joy that a fishing rod with reel and maybe a bottle of beer brings you can’t be compared with anything. Even the kids, someday they can say that they had a great childhood fishing with his dad or mom with a little spinning reel and rod. It’s not about money, it’s something heavenly that I feel every time when I go fishing. Considering all your great passion for fishing, we tried our best to find you some top rated spincast reel for saltwater. The good spincast reels have some major qualities that we focused on. You can totally rely on them, they will go all the way I can assure you that. But everything needs a little care so you must take proper maintenance for the ultimate result. One more thing folks, you obviously looking for an amazing rod if you still haven’t got on! don’t you? check out our latest article on Top 7 Best bass fishing rod for the money in 2019. Hope you find this writing useful and can choose the best saltwater spincast reel for you. Happy fishing!